Tucker came to AAE in September 2014. 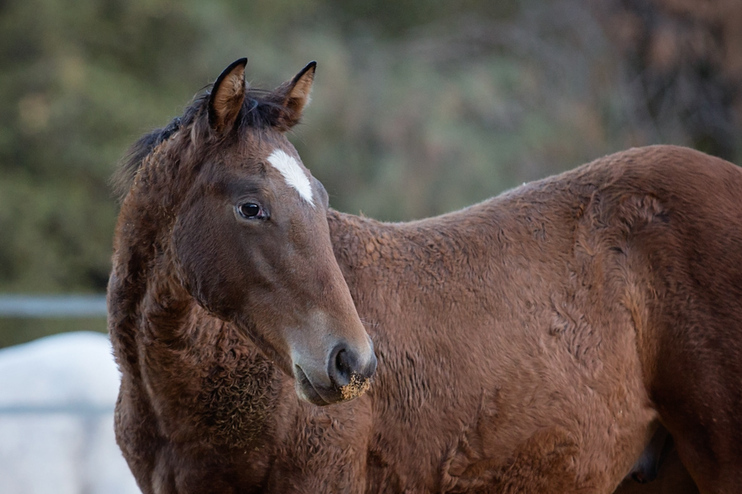 At about five months old, he was one of the oldest of a group of five from Oregon that were part of an ongoing placement effort by the Warm Springs Horse Network. These horses are described as American Heritage Mustangs, “living symbols of the historic and pioneer spirit of the West”. The five have grown and thrived here at AAE, they have been socialized, and they learned their horsey manners from Grammy Sierra. Tucker had little if any handling before arrival, and he was untouchable, reactive, and fearful. He has been learning about halters, leading, hoof care and all of the basics, but he is still untrusting and somewhat reactive. He needs to find a quiet, patient person to give him a forever home and continue his training.